At No. 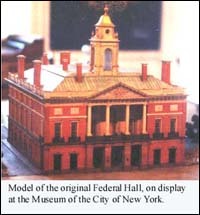 26 Wall Street in Manhattan, sits one of the most famous buildings in American History: Federal Hall. Federal Hall is the famed location where The Stamp Act was signed into congress on October 7th, 1765, and where Washington was inagurated on March 4th, 1789, and finally where The Bill of Rights was signed on September 25th, 1789. New York Party Shuttle will take you by Federal Hall, offering you a detailed history of this historic building along the way.